那你一定很好奇為什麼只是一個orientation而已講得這麼誇張? 那是因為我們有最好玩的遊戲、最好看的表演、最好吃的台灣味便當還有最好的機會認識帥哥正妹 -> 那也就是為什麼我們這次的主題叫遇見!! 還有還有~~ 啊!不能講太多!! How was everybody’s summer? Relaxing? Boring? Not enough excitementtt?? Welllll, look no further! Because September is HERE!! 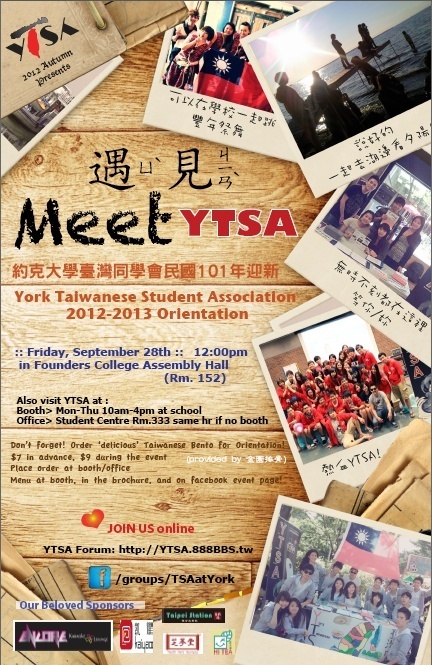 AND THAT MEANS a start of another EXHILARATING school year =D And what better way to begin the school year than with one of YTSA’s MOST AWESOME, EXPLOSIVELY FUN and OUTRAGEOUS EVENT of the YEAR: "Meet” YTSA ORIENTATION!!! W00T!! W00T!! Now—are you curious about what the orientation entails?? Or how you can actively be involved in one of our BIGGEST event of the year!!!!! No worries, because the theme for this event is “遇見”!!! NO—it does not mean “meat”...means “to connect” or “to get together” with others, ESPECIALLY with people YOU HAVE NEVER MET BEFORE (including that cute girl or guy:) There will be ice-breakers and many dynamic games set up across the campus--designed for maximum interaction and amazing fun! As well, dramatic acts, spectacular singing and charismatic dances will be performed—courtesy of YTSA staff and assistants;) AND MUCH MORE! !